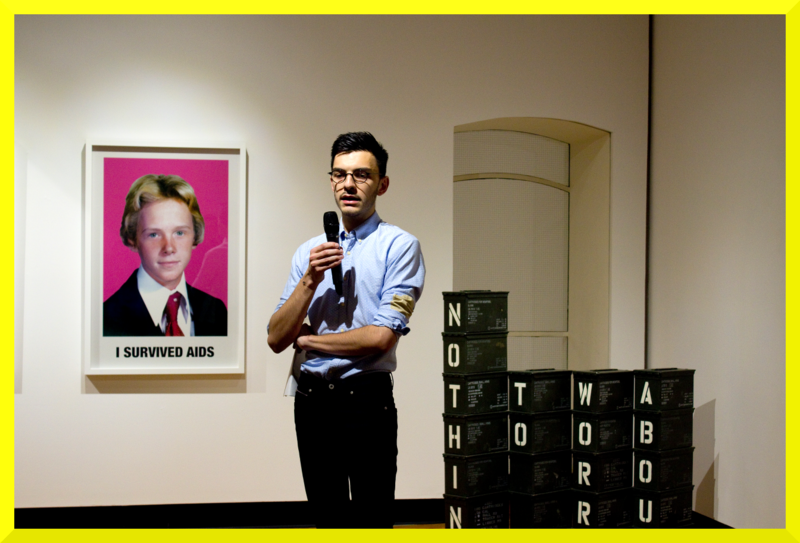 “In case you missed the Curator’s Talk by Adam Barbu, Winner of the 2015 Middlebrook Prize for Young Canadian Curators, for his Exhibition “The Queer Feeling of Tomorrow”, below is a video with the key part of his presentation accompanied by a detailed transcript, below. I’d also like to thank the Jury, who is well represented here, for letting this project be the 3rd Middlebrook Prize for Young Canadian Curators. More importantly, I’d like to say a word about how it all began. I used this platform as a way to experiment with certain ideas that I had previously been engaged with as a Curator, but even the title – I think this word “queer” is sometimes misinterpreted and misunderstood in contemporary culture. So, to have the Jury’s support in making this come to be is really important because it proves that we are building dialogue around certain themes that are not always spoken about in public. I am very grateful for that. I am very happy that each of these works might inspire some kind of thought or discussion that might go beyond the gallery today. Of course, that is a welcome thank you as well. I’d like to keep the structure of the talk kind of informal – I always prefer when a curator or an artist speaks and there is more of a discussion. I you have questions, I am happy to engage with you and talk more about them. In November, we were in Valparaiso, Chile and we did project called “The Disciples” where we brought together 12 former political prisoners from the [Augusto] Pinochet regime and we re-situated large scale portraits of these men in the former prison and torture facility where they were once held. Ironically, [this prison] is now a fully functioning cultural centre. That’s one example. Another is a related project called “Windows from Prison”. We did that in April this year. This was a project that was also initiated by the US Embassy in Ottawa. That Project revolved around an artist called Mark Strandquist and he worked with individuals in maximum-security prisons across the States. The resulting exhibition was based on the materials and writing that came from Strandquist’s interaction with the prisoners. These are examples of how I “tick” creatively. More so, they relate to what is going on in this space in less explicit ways, but in my own creative process. 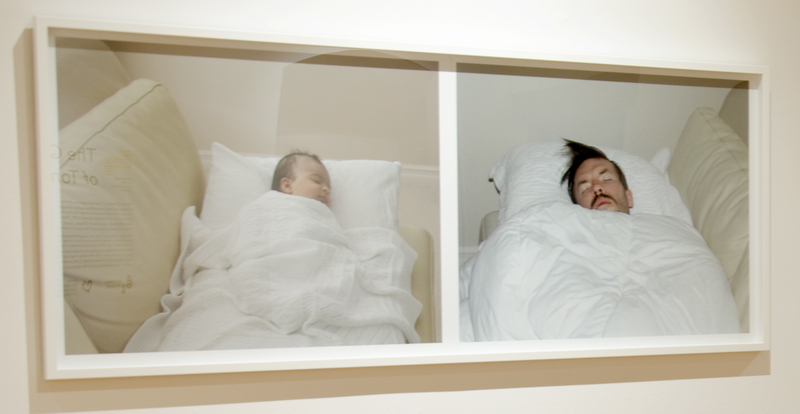 I see the Middlebrook Exhibition as an extension of this in the sense that there is a move taking place in my own thinking away from spectacular logic towards the indecisive, the unresolved and contingent politics of everyday resistance that are so often hidden view in our everyday lives. To provide some context, I want to read a bit about the projects. 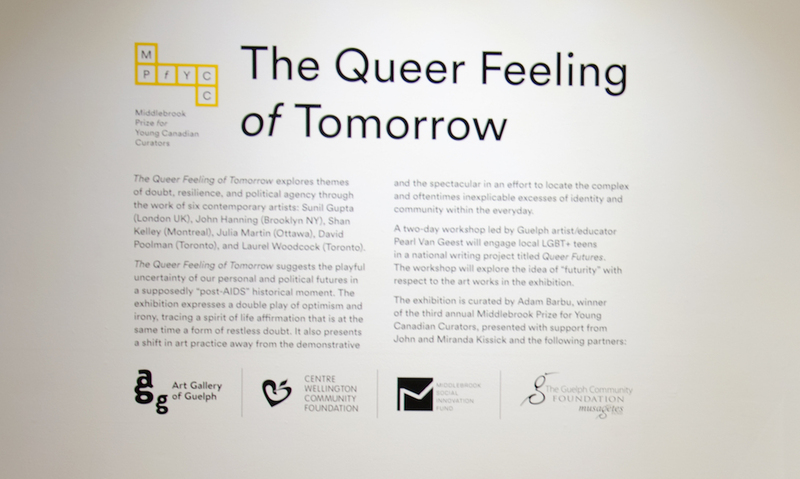 The Queer Feeling of Tomorrow explores themes of doubt, resilience and agency through the work of six practicing local, national and international artists. They are Sunil Gupta, John Hanning, Shan Kelley, Julia Martin, David Poolman and Laurel Woodcock. Each of these artists worked to locate the complex unspoken and oftentimes inexplicable excesses of identity and community. In tandem with this Exhibition, we are producing a workshop, taking place at the end of November, entitled Queer Futures and run by Pearl Van Geest. The idea behind the workshop is to support the Exhibition with dialogue and exchange with high school and university students. These people will come together in one space to build a catalogue of the Exhibition, which will be available online shortly. It suggests a playful uncertainty of our personal and political futures in a supposedly post-AIDS historical moment. Together these works construct an amalgamation of obstructed documents, fragmented biographical notes and half emptied out forms held in a continuous flux of contextualization and re-contextualization and de-contextualization. So, it’s this ongoing process of exchange between the works, and against them as well. The Exhibition expresses a double play, in this respect, of optimism and skepticism, tracing a spirit of life affirmation that is, at the same time, a kind of restless doubt. One the one hand, these works trace a kind of candid levity and, on the other, they embody a self-conscious facetiousness and also harsh irony. Unlike what many of you are thinking, based on the title, the Exhibition is not about Queer Art or sexual identity proper. Neither is it interested in documenting the changing face of LGBT acceptance in mainstream western culture. Instead, this queerness I am trying to locate in the Gallery space is really about a provisional retreat from ideas of willful or transparent political speech. The sensibility that all of these artists embody thrives within an altogether inconsistent formal language that is composed of unfinished sentences, circular word babble, abandoned signs, precarious historical revisions and so on. Given the face that, today, there is no shortage of exhibitions that focus on the relationship between AIDS issues, late twentieth century identity politics and related forms of activist artistic practices, I think it is important to pose a question that has motivated my thinking creatively throughout the course of these three years that I have been speaking about. How do we situate or cultivate queer thinking in society, in the gallery and otherwise without submitting to problematic cultural essentialisms or the rhetoric of a post-everything identity politics? To address the challenges of this intentionally difficult question raises what I am attempting to pursue in this Exhibition: a sense of positive differentiation that can’t be reduced to the logic of queer representation, as we might traditionally think about it and, therefore, the didacticism of a rigid, objectivist historical narrative of seamlessly unfolding events in time. In other words, this means exploring a language of difference that is not simply interested in verifying the injurious effects of hetero-sexist or homophobic discourse in culture that might seek to present works of art and the lives of artists as they actually occur in society. 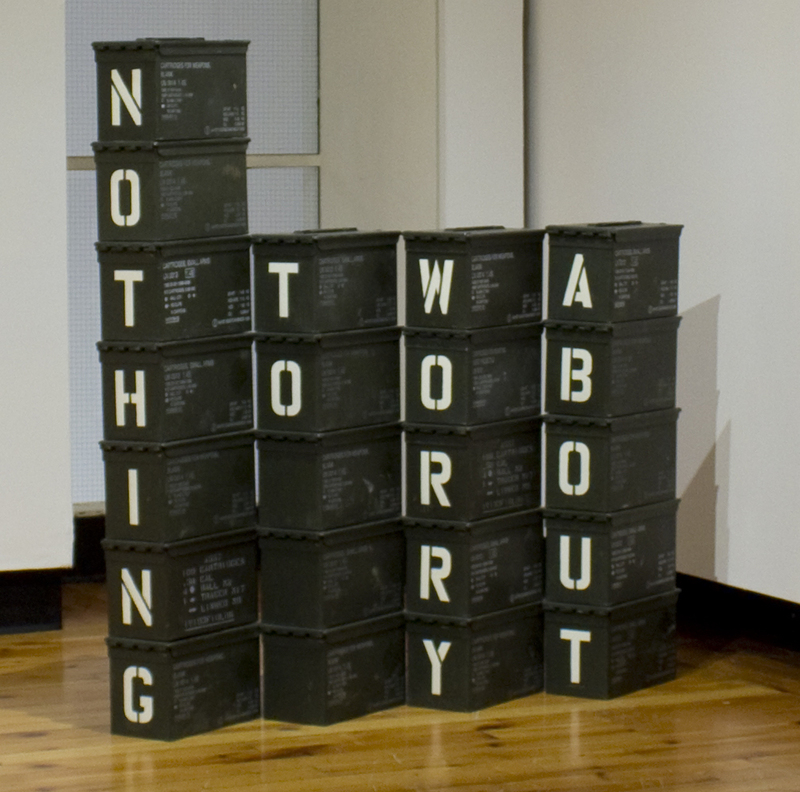 It’s worth stating that, in July, I produced an Exhibition in Toronto, at a small gallery, titled A Minimal Doubt. Many of the ideas in this space are an extension and continuation of those themes I was dealing with. That Exhibition brought together three artists, all Canadian, Andrew McPhail, Vincent Chevalier and Shan Kelley, who is also here in this space. 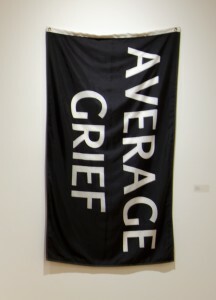 This Exhibition was nine works in total highlighting cross sectional readings between HIV-positive status and aesthetic value proposing a certain deferral of self-knowledge through queered forms of language and text. The title, A Minimal Doubt, is intended to raise a problematic. When we state that doubt is minimal, it evokes a kind of implicit hope. I’m also interested in this term “doubt” because it keeps the ideas of inaction and obsolescence at the centre of the discussion. I would say this is the essential kernel, or the moment of decision that inspires this Exhibition and the works it contains. Now, I’ll turn to the artists themselves. Let’s begin with David Poolman, who has two works here. The first is titled Protest Cancelled Due to Rain, which is the sculptural object in the plinth. 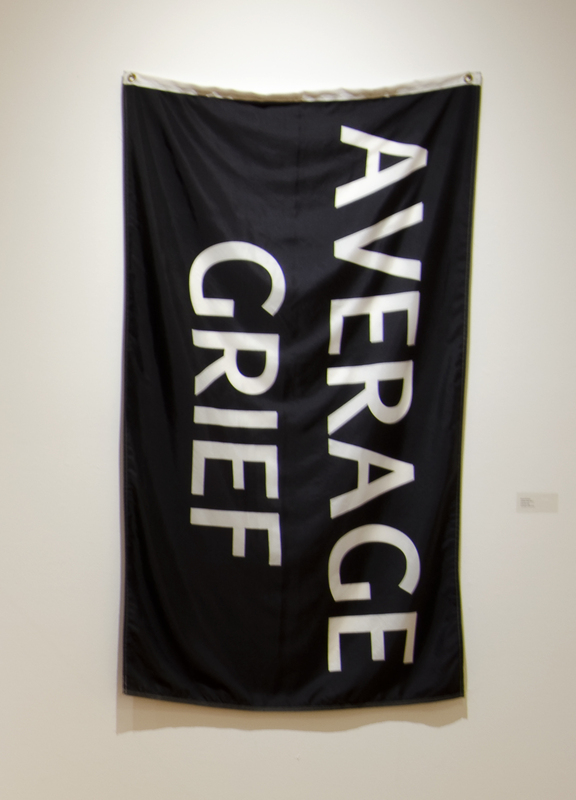 The second is Average Grief, which is the black flag. My thinking behind these two works is based on the thinking that the sign and the flag are the two most iconic forms of political will that we know today. And, to see the way that David has half-emptied out both of these objects with the precarious indecision becomes a perfect welcoming gesture to the other works that follow in this Exhibition. The striking element of the signs is that they are shrunken down and piled up so that they have a sense of a loss of identity, and become new objects in the world. The next is John Hanning. His three works here are called I Survived AIDS, originally created in 2013 but he created a special edition series for this show. These three objects, with obviously striking subject matter, are authentic middle school portraits of the artist as a young child. They are re-positioned and acting as a background for a future of violence of stigma that he could not, and did not, know at that point. I’ll skip Shan’s work for a second and come back to it afterwards. The next work to point attention to is Julia Martin’s Uneasy from the series You are Talking to Yourself, which is an altered image, ink-jet print. Each of the works in this series, but this one in particular, is striking with respect to the other works in the Exhibition, is comprised of a different broken off adage or an axiom or even explication that is re-purposed on a found, digitally accessible, public domain image. That’s Julia’s work. The other works in the series are fantastic. If you get a chance to check out her website, I would really encourage you to do so. Laurel Woodcock is the neon work on the last wall here. 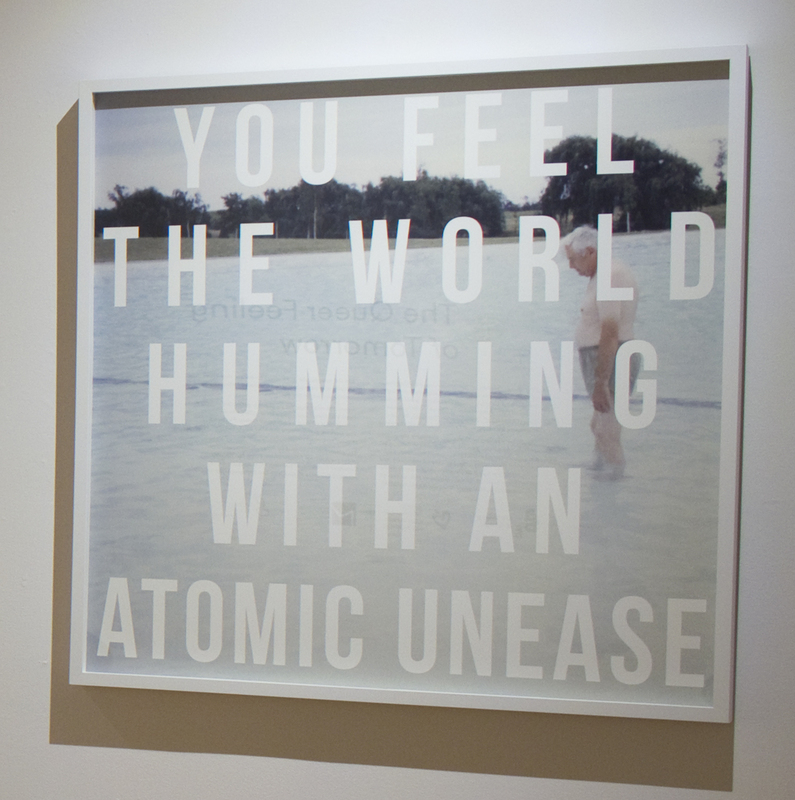 The title is Untitled, but it does have an extended one, which is “A Film by John Baxter (1946), A Song by the Beatles (1969), An Album by Nina Simone (1971), and a Novel by Tom Holt (1993)”. The work was originally created in 2011 but I’m really happy to see it here in this space. 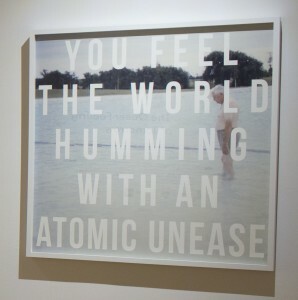 I think it adds a certain, almost interruption, of the bodily phenomenological encounter of the artwork in this space. Of course, what’s striking here is that we are forced to look down on a phrase that is so, I don’t even know how to phrase it, “precariously familiar” and also so distant. 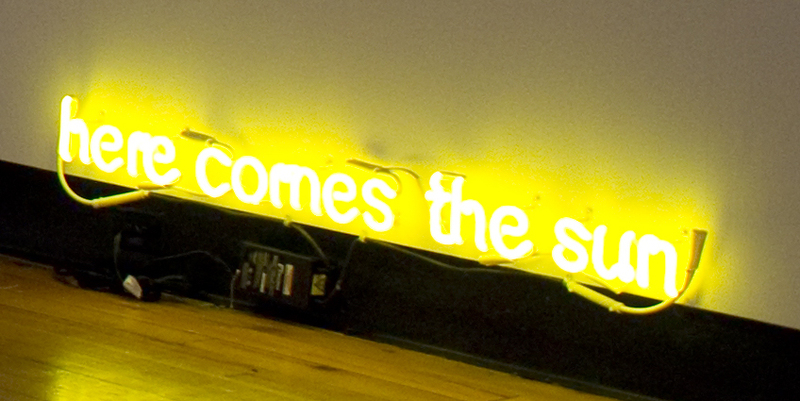 We all know this phrase, but to see it in a different context, especially with these surrounding works, adds a new dimension on this idea of agency. With John, Sunil, Julia’s and also Laurel’s work, the idea of appropriation and quotation is something to stress here, especially when we are talking about themes of self-knowledge and what this means to contemporary culture. Lastly, I’d like to draw focus to Shan Kelley’s two installations. He is a really phenomenal young artist, who I am glad to be able to support. 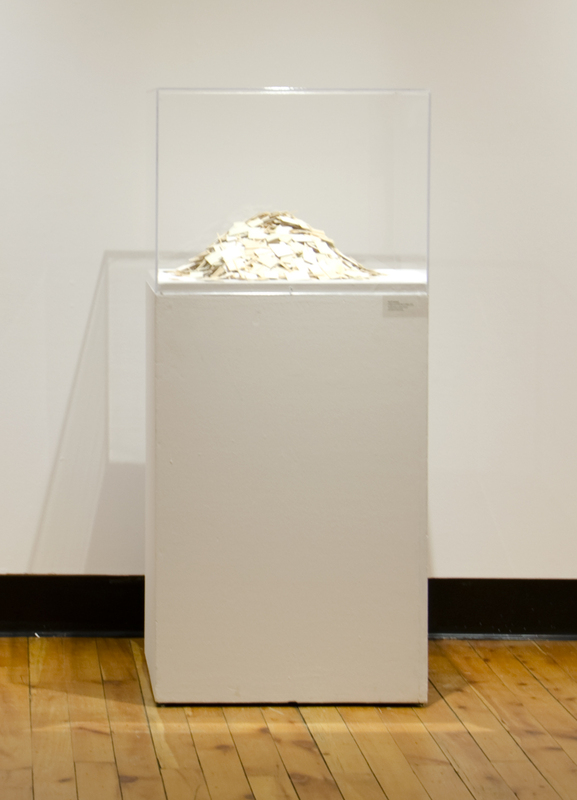 The mixed media installation before us here Mostly Blanks (2012). 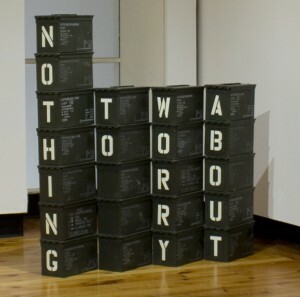 A note on the materiality here: “Nothing to worry about” is painted in an industrial powder coat spelled out in standard military lettering along a group of 22 authentic military canisters. You’ll note that the markings on the side: some bear the text “Blank” and some bear the text “Small Arms”. When we position this in the context of Shan’s interest in critically exploring his own HIV undetectable status, the intersection of this medical-militaristic and colloquial discourse is important to stress here.